Caption : HYDERABAD:18/02/2010:- Large number of women gathered outside the ?Support Centre for Women? 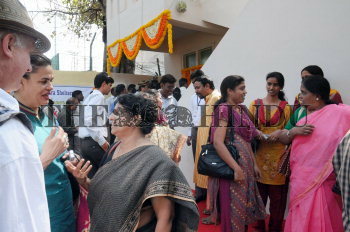 (Mahila Police station) which was inaugurated by city police commissioner A. K. Khan in Hyderabad on Thursday. The centre is one of the strategic responses to address the needs of women survivors started in association with Oxfam India and SWARD, it emerged as a role model for civil society and government collaboration. Photo: Mohammed_Yousuf.